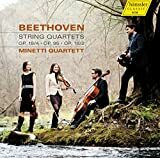 The Minetti Quartett, a young string quartet from Austria, was one of the highlights of our 2006 and 2007 review seasons. The discovery was thanks to the Embassy Series, the same organizer that brought them back to the area, after a long absence, for a concert on Friday night at the Austrian Embassy. (The group, on a North American tour, also appeared on Saturday afternoon in Baltimore.) 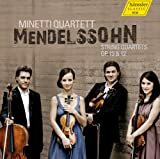 The experience was not quite the same, however, since the quartet now features a new violist in Milan Milojicic, the principal violist of the Salzburg Chamber Soloists and the Deutsche Kammerakademie, who replaced Markus Huber in 2011. Furthermore, a family matter prevented first violinist Maria Ehmer from taking part in the tour, so she is being replaced by Božena Angelova. They opened with one of the quartets from their new Beethoven disc, op. 18/2, unified and crisply articulated, with a pleasing control of sound, aside from some unpleasant growls from the viola. A playful coda to the first movement led to a glowing slow movement, with gently pulled rubato and minimized vibrato. Much of the work rests on the sound of the first violin, which challenged Angelova at times, but the third movement was light and fun, pitched just right in character, although the fourth movement was a bit too fast for comfort. It was paired with Arvo Pärt's Fratres, in its original formulation for string quartet from 1977, which was played just as it should be: the harmonic-infused chords glistened, lush sounds that gently shifted, like a kaleidoscope, around the unchanging drone in the second violin. At one point, a plane flying low lent its rumbling boom to the sound, fitting right in. The piece, from the first phases of the Estonian composer's experimentation with the tintinnabular form of what has since come to be called "holy minimalism," sounds as fresh as it must have toward the end of the Age of Aquarius, a cliche that had not yet become a cliche because of endless decades of self-recapitulation. The program ended with a Mendelssohn quartet, op. 44/2, not one of the pieces on the group's Mendelssohn disc from a couple years ago. With the fast tempos taken as quickly as possible, this was impassioned playing that still never felt forced. The agitated stuff had its expected effect -- the repeated notes of the scherzo theme just buzzed -- but it was the smooth legato of the first movement's second theme, for example, that swayed me, as did the viola lament of the second movement's trio section. The third movement did not drag, in a gentle lilt, with some fine cello solos and a quiet end that showcased the silence, which the audience, after clapping after almost every movement, finally allowed between movements. The virtue of that silence was apparent as the group was able to bite into that empty space with a finale that was not just sawed away at, but given much careful gradation and shaping. The group rode the piece thrillingly to its end, in a way not steely or desperate, just intense. Patisserial delights awaited after musical ones, with slices of warm Wiener Apfelstrudel and other goodies laid out in the reception room.